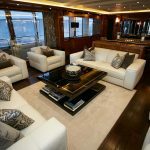 Enjoy a stunning retreat on board the No. 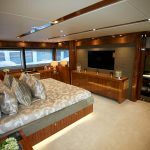 9 of London, a timelessly elegant luxury yacht that is sure to delight. 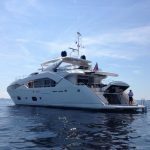 At approximately 34.5 meters and with five stylish cabins, this beautiful vessel can comfortably accommodate up to ten guests. The interior of the No. 9 of London is timelessly elegant, with rich hardwood flooring and paneling as well as lavish designer furniture. 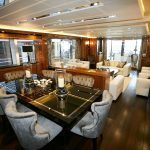 The main saloon features a comfortable and sophisticated lounge room, while the formal dining area is nearby and seats up to eight. 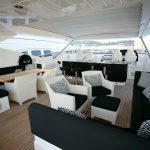 Further dining spaces can be found on the deck, including a spacious alfresco dining area with space for ten, and a bar – ideal for entertaining, or relaxed meals as a group. 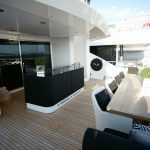 A further deck features a comfortable and informal sitting area which is covered, making it ideal for all weather conditions. You’ll also find ample space for sunbathing and enjoying the warmth. 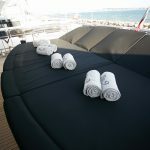 Of course, the ocean also presents endless opportunities for fun in the sun and surf, and the No 9 of London comes equipment with various watersport accessories. 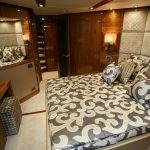 After relaxing days aboard the yacht, at the port or in the water, you can retreat to the sumptuous cabins. 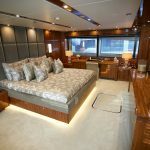 With five in total, the master suite is particularly expansive, while the additional four cabins are each modern and well-appointed. 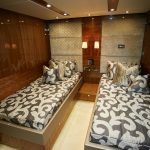 Two of the cabins feature a convertible layout (to either a twin or double) for added flexibility and convenience. 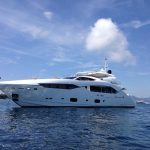 This beautiful luxury yacht boasts an experienced crew of six members, who are onboard to ensure your trip is utterly relaxing and delightful.